We are a leading Manufacturer of reed switch from Nashik, India. We are an unparalleled name in offering a premium quality Reed Switch. 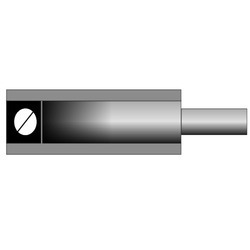 Used to install in elevators, the offered reed switch is preferably used where mechanically actuated limit switches no longer function satisfactorily due to unfavorable operating conditions such as high or low start-up speeds. In addition, our reed switch is tested on diverse parameters in order to ensure its flawlessness. Our customers can avail this reed switch from us in different specifications.